Char-Broil Patio Caddie gas grills for sale at steeply discounted prices to save you money. 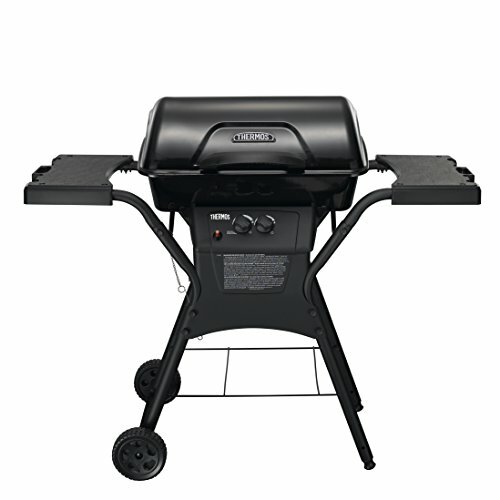 Char-Broil Patio Caddie gas grill is the perfect buy for apartment, condo, townhouse living and grilling. Don't let the small footprint of the Patio Caddie fool you, the Patio Caddie has all of the features and performance of a full size grill, without taking up your whole patio. You can view a full description of the Char-Broil Patio Grill for sale by clicking on the links below, which will open in a new window on eBay. The Char-Broil signature gas grill series offers durable, stainless-steel construction, & a wide variety of premium features which deliver the ultimate grilling experience. The Char-Broil signature 4-burner cabinet 530 features four top-ported 443 stainless-steel burners which are built to last, & deliver 32,000-btu's of heat across 530 square" of primary cooking space & the 210 square" warming rack. 13,000-btu lidded side burner is ideal for sauces & sides, & the lid folds down to provide additional prep space when the burner is not in use. All Char-Broil signature series grills are dual fuel compatible, so they can be easily converted from propane to natural gas. The solid stainless-steel grates & warming rack are durable, & provide an excellent surface on which to cook, with greater zonal cooking control. Features Surefire electronic ignition, offering a reliable spark at every burner, & a tank Gauge for monitoring LP gas level. The signature 4-burner gas grill features a cabinet with two stainless-steel front doors allowing for easy access to the storage area- ideal for the propane tank, tools & accessories. The V-shaped stainless-steel firebox is designed to deliver efficient cooking & greater durability, & the lid-mounted temperature Gauge offers added heat control for the griller. Fixed stainless steel side shelves offer plenty of work & prep space. Front accessible grease tray & removable grease pan offer easy cleaning & replacement, & the grill's cabinet sits on four casters- two of which lock- providing easy mobility, & the ability to secure once in place. 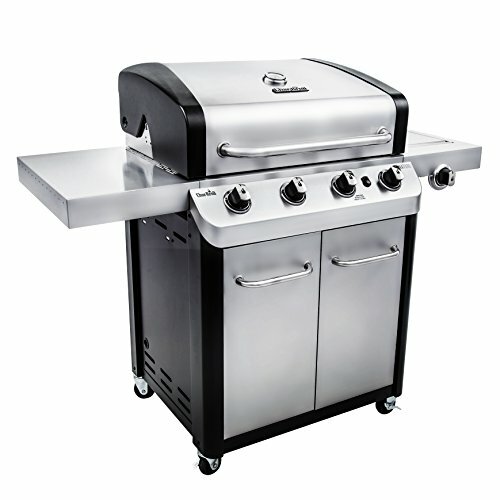 Assembled dimensions: 55.3" w x 27.6" D x 46.3" H.
The thermos 265 2-burner gas grill features 26,500-btus of heat, spread across the 265 square" cooking surface. Porcelain-coated grates help keep food from sticking & are easy to clean. Features plastic side shelves, with built-in tool hooks for storage, piezo ignition system for fast & reliable burner startups, & a porcelain-coated steel lid & firebox, both designed to withstand the elements. Sits on two 6" wheels & two stationary legs for easy portability & stability once in position. Assembled dimensions: 49" w x 21.9" L x 41.5" H.